MANY! Come check them out (and we mean that literally)! We’ve got a new display featuring books and movies about things that happened in 2012. Or how about a book from the “‘Tis the Season to be Reading” display, which also includes many entertaining films and CDs? It’s all here at the library. 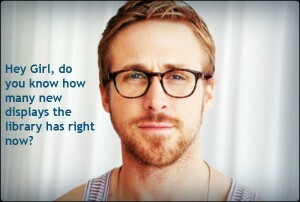 Just ask Ryan Gosling. He knows.